If you’re in need of something stylish, timeless, and reliable, the BeatsX are the wireless earbuds for you. Just keep them away from water; after all, they lack an official IP rating. Since the inception of the Beats brand back in 2008—before it was swallowed up and transformed into a division of Apple—we’ve come to recognize the lowercase “b” logo and occasionally ostentatious design choices. But the BeatsX are different. These speak confidently with a minimalist design comprised of sleek, uninterrupted lines. Beauty isn’t their main asset, though. They also boast powerful hardware under the hood. Editor’s note: this article was updated on March 29, 2019, to include microphone data and update scoring. Who are the BeatsX for? iPhone users. Noted as being one of the best pairs of iPhone earbuds, the BeatsX bring many of the same benefits of the Apple AirPods without the drawbacks of true wireless technology. The integrated W1 chip and Class 1 Bluetooth promotes reliable connectivity with a 100-meter range. Fashion-conscious consumers. Unlike previous Beats models, the BeatsX feature a subdued design and understated all-black or all-white color palette, presenting a more sophisticated style to consumer-friendly earbuds. Purchasing the BeatsX affords listeners four pairs of ear tips, an array of secure-fit wing tips, a carrying case, and a Lightning charging cable. Yes, as an Android user, it’s weird seeing Lightning rather than USB-C, but hey, it works. Connecting the BeatsX cables is a Flex-Form cable, which is comfortable to wear and handles moisture well. Sporting a mainly plastic construction doesn’t cheapen the feel of the BeatsX. In fact, the plastic neckband caps and earbud housings pair nicely with the rubberized Flex-Form cable, much like how a third-tier Cabernet pairs well with tonight’s TV dinner. Cheap, sure, but surprisingly good. A discreet power button inlaid in the end of the neckband maintains the low-key aesthetic, while still being functional. The same can be said for the in-line mic and remote, which sports a prototypical layout and allows for virtual assistant access, be it Siri or Google Assistant. To my glee, the volume controls are compatible with Android devices. Found descending from the BeatsX right earbud is an in-line mic and remote, allowing basic playback control and virtual assistant access. Ergonomics—a word which might as well have its own department in Home Depot—are excellent and can be attributed to the angled earbud nozzles and varied ear and wing tips. It’s worth it to take a few minutes and figure out which provided ear tips best suit you as it drastically improves audio quality. Additionally, the earbud housings are magnetized. Albeit, the magnets could be stronger as it’s easy to separate them if a piece of clothing tugs against the housings. While they’re not officially sweat-resistant as per the official product page, they survived my three-mile run and weight-lifting routines. Although—full disclosure—I detest running with neckband style earbuds and don’t find the neckband bobbing or cable wobbling to enhance my runs. In all fairness, though, there are plenty of popular exercise-oriented neckbuds available. If you’re going to exercise in a pair of Beats earbuds, you may want to try your hand at the PowerBeats3 Wireless. If you do happen to break a heavy sweat while wearing these, though, be careful. Apple may not help you if the BeatsX malfunction, since they lack an IP-rating. The Powerbeats3 Wireless, however, are a more durable alternative. The BeatsX microphone may struggle to accurately relay lower voices but sounds pretty good with female voices. The microphone performs exceptionally well in noisy environments. With construction just 50 meters away, the BeatsX attenuated background noise with ease. Not to mention that I was also surrounded by multiple voices in windy Atlanta. The chart above shows that the mic struggles to accurately relay lower voices, usually male. However, registers like mine — which has a fundamental frequency response of about 160kHz — sounds accurate. When talking with friends on the phone, they thought I sounded good and was relayed clearly. Seeing as the battery life is listed at eight hours, it’s a disappointment that our objective testing revealed that the BeatsX provide 5.45 hours of playback before requiring a recharge. Fortunately, a full charge cycle takes just under an hour, which is about half the time of most wireless earbuds. And five minutes of charging provides two hours of playback when the battery is low. Additionally, you’ll likely listen at lower volumes than 75dB(SPL), which should extend the battery life. With Fast Fuel, you can give the BeatsX an extra two hours of playback from just five minutes of charging when the battery is low. So long as we’re discussing charging methods, you may notice that the Lightning input is completely exposed. While this makes the BeatsX look sleek, it’s a bit worrisome to have such an integral part of the earbuds subject to dirt, dust, and water. Form before function, I suppose. For optimal connectivity, you’re going to need an iOS device. It allows you to take full advantage of that delicious W1 chip and AAC Bluetooth codec compatibility. If you’re coming from a non-iOS device, you’re going to experience about a half-second of audio-visual lag. While this is bearable, it’s not ideal. The BeatsX can connect to two devices simultaneously and alternate between the two. That said, connection strength and stability is excellent when listening from various Android and Windows devices. I did, however, experience short-lived spotty connectivity when walking around my local park. This shouldn’t cause much pause, though, seeing as most Bluetooth devices struggle in large, open environments. How do the BeatsX sound? Although the frequency response isn’t neutral, it’s enjoyable for most consumers and preferred for activities like exercise. To improve low-end attenuation, make sure to outfit the BeatsX with a pair of memory foam ear tips. Generally speaking, the BeatsX reproduce a fairly bass-heavy sound but also place quite a bit of emphasis on midrange frequencies. For the most part, this can be seen as a good thing, because it counteracts vocal masking. It’s still a problem though. 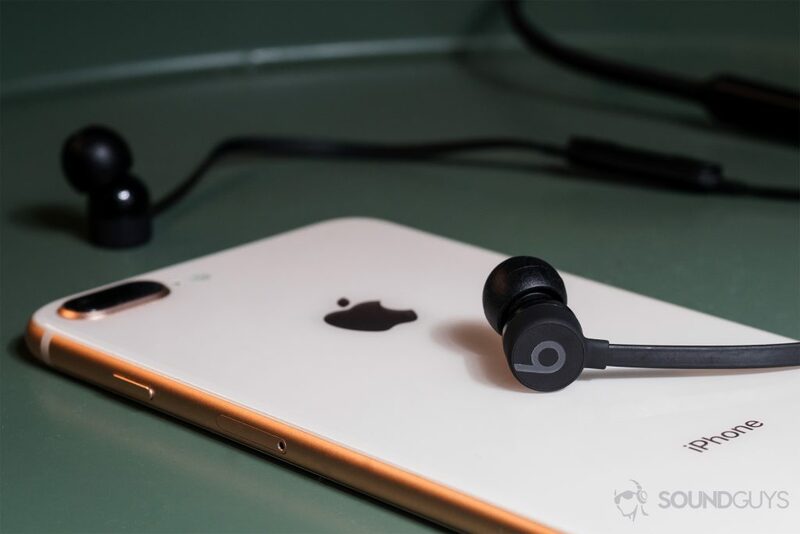 Relative to the PowerBeats3, the low-end emphasis could be considered subdued. Treble, on the other hand, is audible, but much of the detail that rings from the instruments’ harmonics are lost in the din. Isolation is OK. If you want to improve it, make sure to invest in a pair of memory foam ear tips. Doing so attenuates external noise by creating a more cogent seal. As a result, you’ll enjoy more powerful low-end reproduction. In the Latino-inspired I Like It by Cardi B, her animated vocals are often masked by the low-end. As Cardi B raps her way through the intro—which lacks the heavy bass found in later verses—it’s easy to hear her above the claps and background instruments. However, once the sub-bass kicks in at 0:57, it’s hard to hear her. Though this can be frustrating if you’re looking for a neutral, accurate listening experience, many consumers won’t notice the distortion and masking. As a matter of fact, it’s quite enjoyable to the consumer ear and preferred in day-to-day situations, say during a noisy commute or while exercising. Cory Wong by Vulfpeck, featuring contributing artist Cory Wong, takes full advantage of Wong’s adroit picking and slides. When listening to this funky instrumental through the BeatsX, the guitar solo that begins at 1:33 sounds good as Wong alternates between D, D#/E, and C notes. Midway through the solo, the hi-hats re-enter and resonate between 3.5kHz-5kHz. The subsequent reverb from the harmonics are difficult to hear above the solo and groovy synth noises. At just under $100 from Amazon, the BeatsX are a great deal and reliable pair of wireless earbuds. Yes. Seeing as these earbuds are just under $100 and feature excellent connectivity—the bane of all Bluetooth headphones’ operational existence—these are a great deal. While the BeatsX earbuds aren’t as flashy as the company’s flagship Studio3 Wireless headphones, they are Beats’ best in-ear option for daily listening. The neckband, in-ear design gives it a distinguished look relative to the company’s other offerings. While you won’t be blown away by the sound quality, the ease-of-use, comfortable fit, and Fast Fuel charging make these worth it. Plus, if you’re just looking for a pair of versatile, stylish earbuds to get you through your days, the BeatsX are—well—the earbuds to beat.